The Intramural Sports Program supports the Department of Wellness and Recreation’s mission of maintaining a social and healthy lifestyle by offering sports promoting exercise & physical activity, teamwork, and sportsmanship. The Intramural Sports Program offers participants the opportunity to play competitively or recreationally in a variety of sports and activities such as flag football, soccer, volleyball, basketball and kickball, and others. 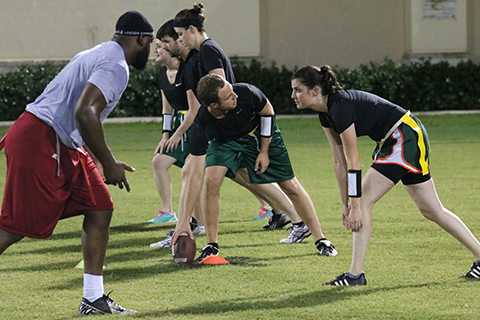 Teams compete against other teams within the UM community, and there are many different divisions within intramurals. These divisions include IFC, Men's, Women's, Pan-Hellenic and Co-Recreational leagues. You do not have to be an amazing and accomplished athlete. There are many different divisions offered such as IFC, Men’s, Women’s, Pan-Hellenic and Co-Recreational leagues. Trophies awarded at the end of the year to the top IFC, Pan-Hellenic, Housing area and Independent teams based on their point systems. Each sport and special event has its own deadlines and meeting dates. View the Spring 2019 schedule for complete details. UM’s Intramural Sports program uses IMLeagues as a way for participants to register their teams, manage and find players, see updated schedules and standings, and interact with other players and captains in an online community created just for UM. Visit www.imleagues.com/miami to enter UM's IMLeagues.com portal. Learn more about IMLeagues by visiting our information page. For complete IM policies & procedures, including information about our special event tournaments and post play, please review our IM Handbook. In accordance with UM LGBTQ Student Life, Intramurals empowers students to participate in sports divisions based on their expressed gender identity, regardless of any medical treatment. Intramurals will sustain its spirit of competition and will be safeguarded from teams or individuals who might consider misrepresenting their gender identity in an attempt to gain unfair competitive advantages. Students may contact the Associate Director of Recreational Sports for more information. For more information send an email to intramurals@miami.edu.